Not sure?? 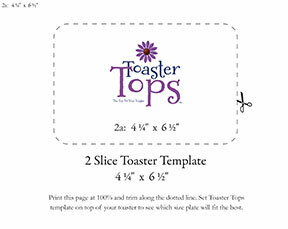 Click on the links below to print a template. Cut on the dotted line and sit on top of your toaster. Make sure it is not hot and unplugged before setting the template on top. Also, make sure that the page is set to print same size or 100% and it is not set to SCALE TO PAGE SIZE. 5 3/4 x 8 5/16"